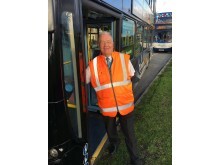 A bus station supervisor from the region’s largest bus company, Go North East, celebrated his 30th year working at this month’s Great North Run; offering essential guidance and direction to spectators, and driving the runners home after their victories. 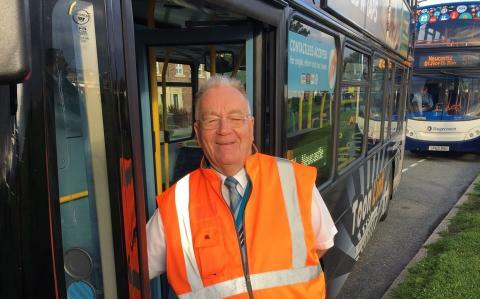 Paddy Fagan has become a well-known face at the iconic half marathon, always ensuring the operation runs like clockwork and as smoothly as possible for competitors, supporters and fellow team members. Go North East has provided baggage and transport services for the event since it began in 1981, and this year was no different; with a dedicated events team of 93 drivers, three engineers and 25 supervisors on-hand across the day. Team members even received the chance to rub shoulders with this year’s competing VIP stars, including comedian Ross Noble and singer Olly Murs, who hopped on-board the bus after completing the gruelling 13.1miles run. Among the runners taking part, was Go North East driver Kevin Brown, who raised £1,500 for the Newcastle-based premature and newborn baby charity, Tiny Lives. Fellow seasoned Go North East competitors also included development manager Mark Ellis, who now has 12 races under his belt and finance director, Paul Edwards who marked his third year competing. Customer services advisor Neil Jones also ran on behalf of Tommy’s Charity, which investigates the reasons behind still births and miscarriages – raising £300.